Summer vacation begins for many kids in the next couple of weeks. 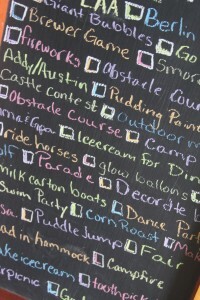 Keep them busy all summer long with a list of fun summer projects and activities. 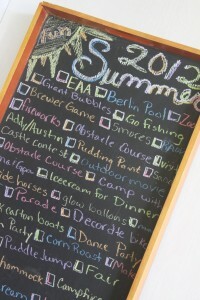 Make a list that includes fun things for everyone in the family and you can cross them off as you do them this summer! This is something that I have been doing with my kids since my son first started preschool. We are on year two and I can’t wait for summer vacation to start so we can start the fun. Even though my oldest was only in school half of the day this year, I can hardly wait to have him home for the summer! I am going to take full advantage of our time together before he is off to a full year of kindergarten next year. As a stay at home mom I love to keep the kids busy with activities that occupy them, educate them, and get their pent up energy out. 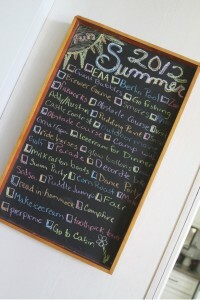 Last year’s list was a total hit, and my kids couldn’t wait to make the summer fun list for 2012. 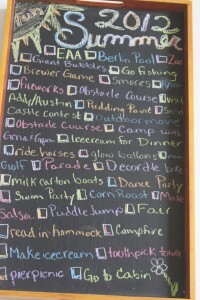 Each and every day last summer, my son would ask what we could cross off of the list that day. He was really really excited to see all of the fun activities we had planned all written out, and he loved crossing them out as we did them. It got him really excited about the next activity for the summer. Not only was it fun for them, but it was really helpful for me too. 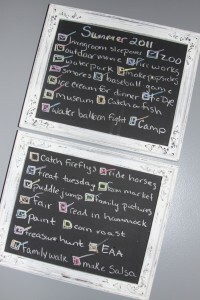 Our summers are busy, and this was a great way for me to easily think up a fun and simple activity just for them each week. A lot of the activities are things that we already had planned for the summer, like camp outs, and making salsa, but a few were added just to keep things interesting for the kids. The list consisted of things as big as a full day trip to a large zoo, to as simple as going for a family walk or making Popsicles at home. The activities don’t need to cost a things and can be big or small, whatever you want. 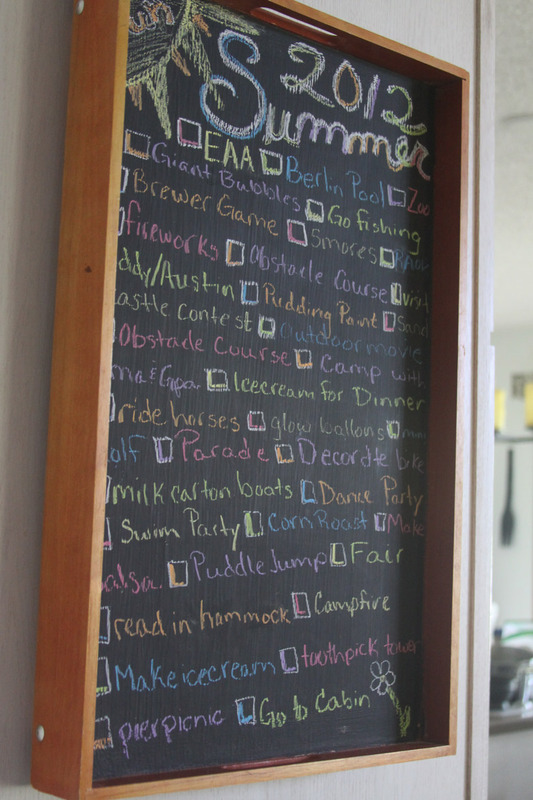 Last year we wrote our list on two small framed chalkboards in the kitchen so we could look and see all summer long what fun lay ahead of us! This years list is similar to last years with a few minor adjustments, and additions. In years past I just made up all of the activities on my own, but this year was a little more exciting for the kids. We sat down together as a family and wrote out our list together. Each family member got a chance to add something that they hoped to do this summer for fun. The kids got super excited to help, and made sure their suggestions got written down promptly. This year our list got a little bit longer because of everyone’s contribution, so I had to find a bigger spot to write it out. I have a serving tray that I painted with chalkboard paint hanging on the side of the kitchen pantry that was just right for our 2012 summer fun list. I have had the tray for almost eight years (it was a wedding gift), and never used it once until I painted the center with chalkboard paint. I usually use it to write my favorite quotes or inspirational words on. I find myself using it for serving all of the time now that it is hanging in the kitchen. 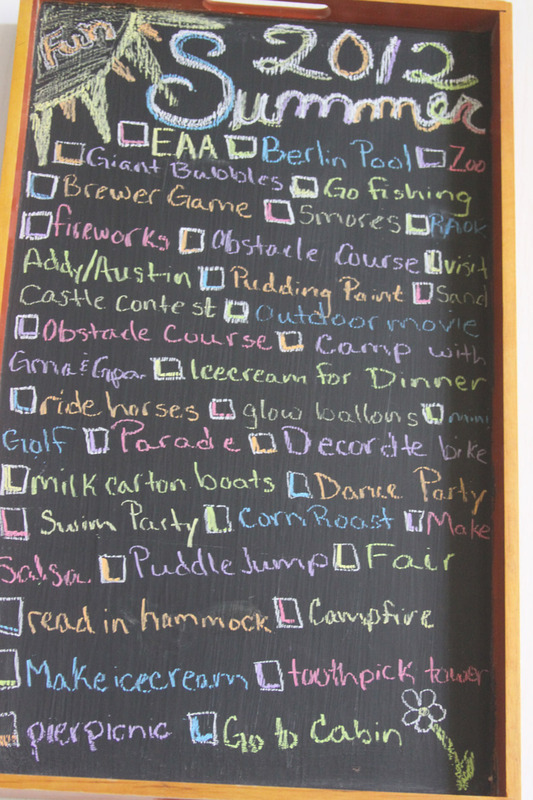 I really like the idea of writing our summer list in chalk so that each and every year we can change things up and add activities that suit the kids age. 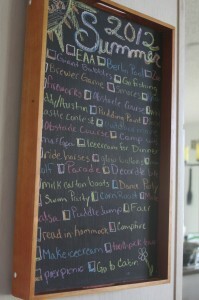 I love the versatility of chalkboards, and this chalkboard tray suits our summer list perfectly. I dont’ need to make anything specail for our list, just erase a quote and add our list to an existing piece of home decor – love that! It hangs in the perfect spot where we can see it from the living room and the kitchen. It is a great reminder for the kids that summer is just around the corner. This can be as simple as a piece of tag board written in marker, or a printed out list that you keep on a clipboard. 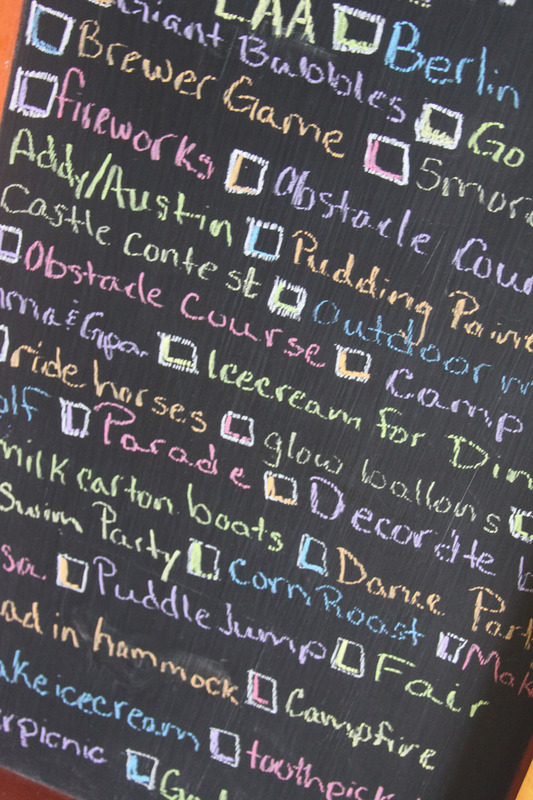 No matter how you make it – the list is fun for the whole family, and makes the summer jam packed with fun and kid friendly projects. Here are some of the activities that we have included on our list this year and a few from last year too. Change things up to suit your family, but I hope you get some ideas from our families list. We don’t always accomplish everything on our list, but we sure have fun trying to. It’s amazing how fast the summer days fly by and this is a great way to keep track of all of the fun, and make sure everyone gets a chance to do something that they hoped for over the summer. I hope this becomes one of those family traditions that the kids really look forward to and enjoy as they get older. I am sure going to relish our summer days together and we will just have to wait and see if we accomplish everything on our Summer Fun 2012 List Of Things To Do! You will defiantly need a little direction and preplanned activities to keep them all happy with that range in age! Hope you the kid’s enjoyed the project and have a fun summer too! I did this with the kids for our summer too. Wrote out a list, but haven’t found the list again. I like how you put it somewhere visible. Nice! Sure makes it easy to think of something to do when the kids are staring at you with that “I’m bored” face (hate that face)!